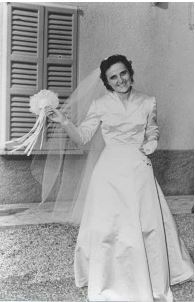 St. Gianna Molla embraced life with gusto. She was adventurous and passionate by nature. Her oldest child, Pierluigi, remembers that his mother loved to drive fast. If the roads were clear she put the pedal to the metal. She was that way with love too. Whatever or whomever she loved, she loved daringly with her whole self—God, the Church, her parents, her children, and the man she fell in love with—Pietro. Temperamentally, Gianna and Pietro were opposites. She was bold; he was reserved. They were close friends but it was Gianna who moved the relationship to the next level. “Fortunately…” Gianna didn’t let the notion that it always has to be the man who should make the first move get in the way of her happiness. She loved Pietro so she told him. I hope you don’t mind if I begin this letter by calling you by your first name and using such familiar language. After sharing our thoughts so openly yesterday, I think we can assume this level of intimacy, which will help us to understand and to love each other more and more. I really want to make you happy and be what you desire: good, understanding and ready for the sacrifices that life will require of us. I haven’t told you yet that I have always been very sensitive and eager for affection. While I had my parents, their love was enough for me. Then, although remaining very united to the Lord and working for him, I felt the need for a mother, and I found her in the dear nun whom I told you about yesterday. Now there is you, whom I already love, and to whom I intend to give myself to form a truly Christian family. Ciao, dear Pietro. Pardon my familiarity, but that’s how I am. Arrivaderci. She wanted to marry him and have his children and she let him know it. But my favorite part is this statement: “But that’s how I am.” Since Italians love to talk with their hands, I picture her raising her arms in a shrug. Gianna knew she was breaking convention but her love was bigger than that. Italians are famous lovers. Love was bursting out of her. She had to proclaim it. Did Pietro think Gianna was a brazen hussy? Read his response dated the very next day. I’ve read your letter over and over and kissed it. A new life is beginning for me: the life of your great (and greatly desired) affection and of your radiant goodness. We are starting the journey of our love. I love you, my dearest Gianna. I could not have received a greater or more ardently desired grace from our Heavenly Mother, Our Lady of Good Counsel, as she is invoked in my little church in Ponte Nuovo. I so wanted and needed love and a family of my own. Now I have you, your love and affection, and I am happy. My love is yours, and I want to raise a family with you. I too want to make you happy and understand you well. Forgive me for not beginning a closer confidence sooner than I did. Thank you for your help and trust. He does show some regret about her having to make the first move, but it’s not because he thought less of her for doing it. He just wished he hadn’t let his shyness stop him. But rather than fret about it, he thanked her for helping him and for believing in him. Gianna made the first move and Pietro wished he had. It wasn’t what they idealized, but they embraced it and it brought them great fulfillment. Later, when he published their love letters, Pietro testified that Gianna’s joyful, expressive spirit and trust in God inspired him to live the same way. Many Catholic singles I know get caught up on little things like—he texted, but he should have called; or the man should always make the first move—as if these things are commandments and it is a sin to break them. They’re not. They’re conventions. Conventions are not bad, just not applicable to each and every situation. Ask yourself: what is more important to me? Conventions or my happiness? The world now knows St. Gianna as a witness of total self giving. She gave up her life to save her unborn child, Gianna Emanuela, whom she loved passionately even before she felt her stirring in her womb. She did not take these gifts and critique them because they were not packaged according to her will or according to an abstract ideal. She accepted them graciously as they were—imperfections and all—as coming from the hand of Providence. It was what made her happy in this life and happy in the next. She went for it. May she guide you to go for it too. Letters and images used with permission from Gianna Emanuela Molla. This article was originally published by the CatholicMatch Institute (the media division of CatholicMatch.com) which provides resources to help single Catholics develop a strong foundation for marriage. Republished with permission. « Saint Bucolus: Middle Child Syndrome?